This article is part of a series of evidence-based analysis of Pakistan’s current political spectrum with the use of statistics, GIS and data visualization. We will further explore the position of Pakistan Tehreek-e-Insaf’s electoral ‘tsunami’ in the upcoming general elections 2013 to forecast if it has a realistic chance to win the next elections. 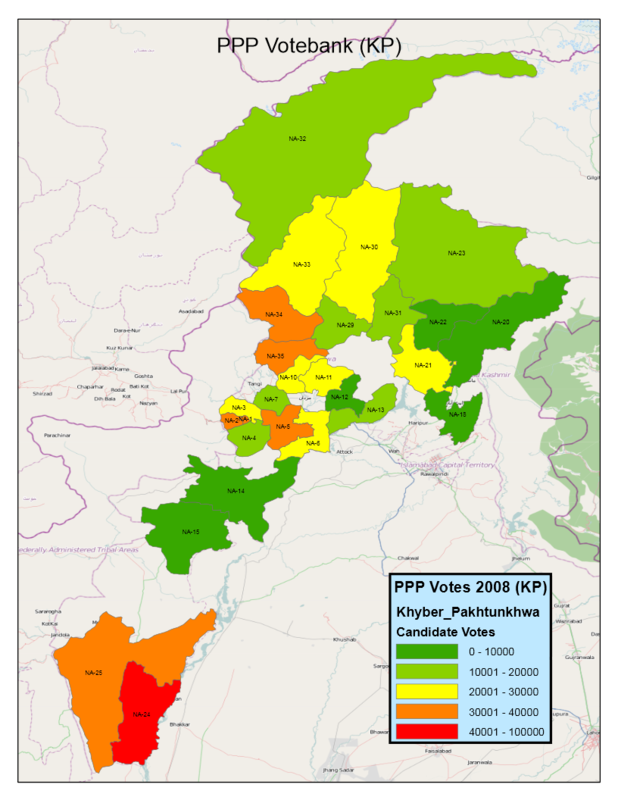 Khyber Pakhtunkhwa province is traditionally dominated by its Pashtun/Pakhtun (hence the name) population with sizeable chunks of Potohari-speaking population in the north-east and Seraiki-speaking population in the south. Awami National Party (ANP) is the flag bearer of Pushtun nationalism that has, arguably, conflicted with Pakistan’s national ideology at times. 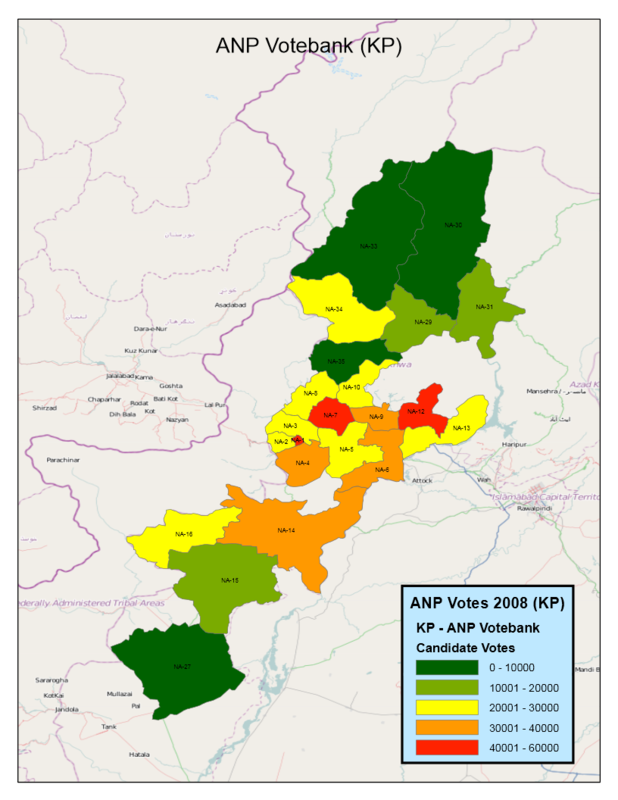 Peshawar, the provincial capital, and surrounding Pushtun dominated districts has always preferred to vote left-wing ANP and Pakistan Peoples Party (PPP). 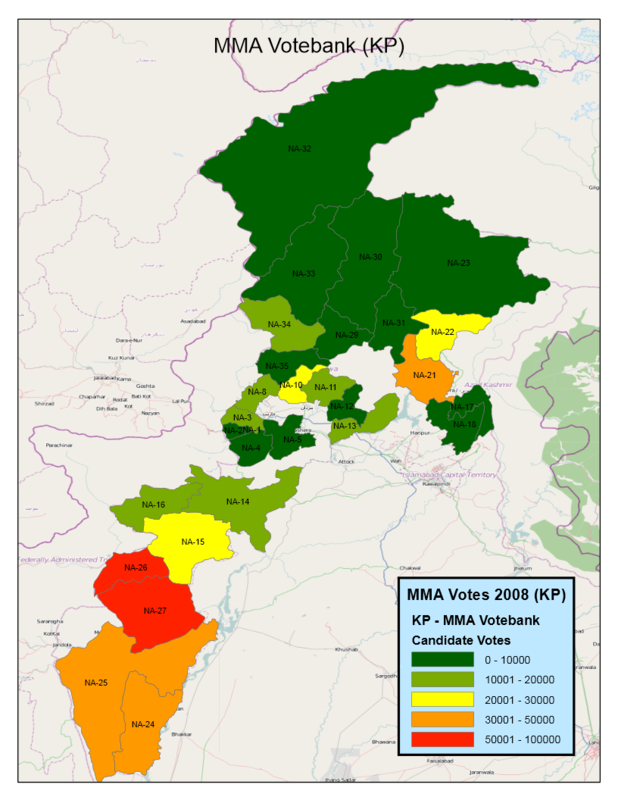 However, in 2002 elections, MMA alliance of religious parties fared better and formed the provincial government, mainly due to anti-American sentiment after the start of US war in Afghanistan. The utter failure to address critical issues and lack of governance has brought the Pushtun votebank back to ANP and PPP. I will forego Hazara division as its politics is closer to Punjab’s than KP’s and PML-factions that normally win here have no affect on the politics of the rest of the province. 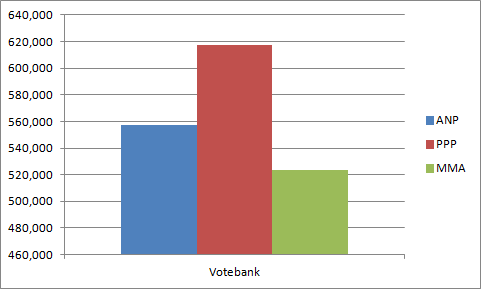 I had studied political strengths by districts earlier but soon realized that it is an ineffective measure as electoral politics is heavily dependent on the constituency boundary than anything else. An electoral candidate’s politics does not overlap the boundary of his electoral constituency and neither is he interested. 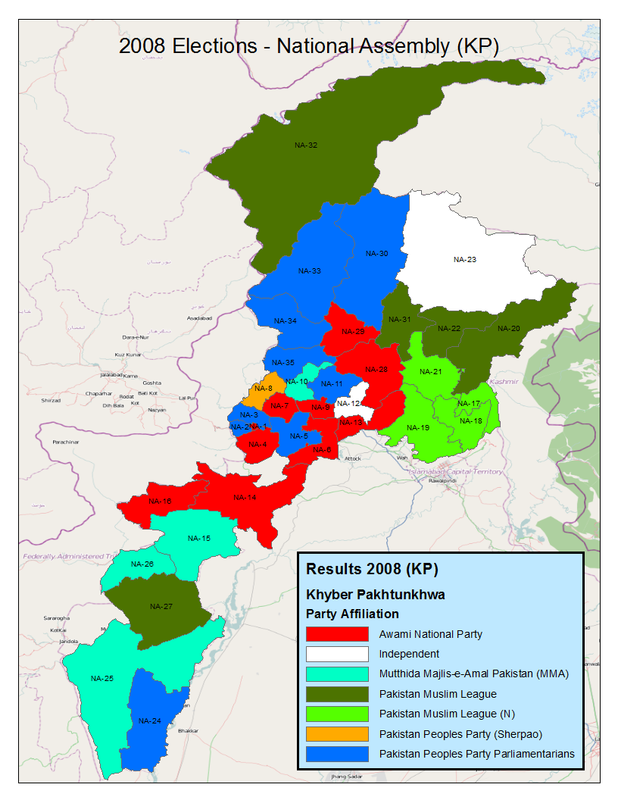 These made me start a project to develop the constituency maps of all constituencies of National Assembly and Provincial Assemblies of Pakistan, and use them in my political study to analyze the patterns. Next, I will present the case of PTI and where its ‘tsunami’ stands in the politics of Khyber Pakhtunkhwa and study through statstics if it has a realistic chance to beat all three traditionally strong parties to form the next government in the province. in coming elections PTI is most favourite to win in KP.